This is when many rabbit owners implement cooling measures for the next several months to ensure their rabbits stay cool. This is important, as rabbits do best in temperatures under about 86 degrees Fahrenheit. At Raising-Rabbits, we have been focused on regulatory "heat," so to speak. The European Economic Area (including the EU, UK, Switzerland, and Scandanavian countries) have strengthened their protective measures for ensuring that you can retain ownership of your privacy and personal information. The new regulations went into effect on May 25, 2018. We have always treated your information with integrity and utmost respect, and now I'm happy to report that Raising-Rabbits also meets the requirements of the General Data Protection Regulations (GDPR). We've also added check boxes to our various information-gathering forms (for example, the e-zine sign up form in the right column of this website that asks for a name and email address). Your check marks signal your age is older than 16, and you consent for us to collect your information for the purpose you give it. We kinda need a name and email address in order to complete your subscription to the e-zine, eh? Thanks for your use of the Raising-Rabbits website! We're proud to be able to provide so much accurate and effective information about raising rabbits. Last Heads-Up for the Year on Fly Control for the Rabbitry or Barn! If you're noticing your fly numbers becoming unbearable, consider obtaining some Fly Predators. Fly predators are tiny flies that lay their eggs in the cocoons of house flies and biting stable flies. This kills pest flies, and at the same time, you'll never realize the predator flies are around, because they could care less about you or your outside picnic. All they're interested in are fly cocoons. They send you a packet of fly predators not quite hatched out of their own cocoons. Once you see they are hatching inside the transparent cellophane wrapper, you take the package to your barn or manure pile, open it, and release the fly predators. That's it! The predators will do their thing, breeding, laying eggs in fly cocoons, and destroying the baby pest flies. It takes a couple months to knock down the pest flies, because the prior generation is still alive and buzzing around. Most of the cocoons under your cages that are ready to hatch will still hatch. But upon release of the predators, more and more of those pest fly cocoons will fall prey to the predators, and by the time a second shipment arrives, the whole process accelerates. By the third shipment, you'll be amazed and happy at the absence of barn flies. At least, I found it pretty amazing! When you place your order, they will help you know how many shipments you will need, and when they will ship them out. They base their advice on the environment of the shipping address, so you can know you'll receive full treatment for your fly problem. Has this lethal disease come permanently to British Columbia? Is There Still Time to Avert this Disaster? Heads up to rabbit owners in British Columbia Canada and Washington State in the US! In case you haven't heard, the Canadian province of British Columbia has been experiencing an outbreak of the deadly Rabbit Viral Hemorrhagic Disease (type 2 virus). This is a highly lethal virus that kills in a matter of a few days, turning a healthy rabbit into a dead one overnight, often with bleeding around the nostrils. Cases in and around Nanaimo BC were first discovered in the feral domestic rabbit population. The outbreak has been spreading north of Nanaimo, and has also jumped the Salish Sea into Richmond and Delta, in the south of the greater Vancouver BC area. RHD is endemic in Europe and China. I am not sure if it is known just how this outbreak got started in southern BC, but it is possible to transmit the virus through the purchase of rabbit meat or rabbit pelts originating in China or other endemic areas. Despite rigorous quarantine efforts, the disease has occurred in several domestic rabbit herds owned by responsible rabbit breeders. The remainder of these herds have been euthanized in order to prevent the spread of the disease. 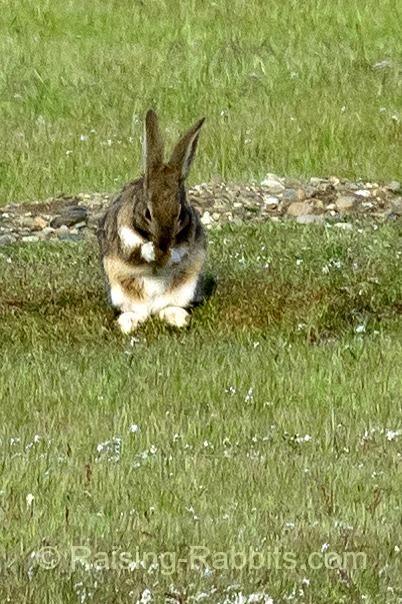 Feral San Juan Island rabbit grooms itself in a field of burrows. You've seen your own rabbits do the same. No cases have as yet been seen in Washington State, however the state and the province share a border across the northern Washington. The Olympic Peninsula is connected to Victoria BC by ferry. It would be frighteningly easy for the virus to piggyback over to the US on peoples' shoes or clothing. I am convinced that the BC authorities have no idea of the gravity of the outbreak, including the long term ramifications of failing to eliminate the virus from the environment. This includes veterinary services. Vets typically understand dogs and cats very well, but when it comes to rabbits, vet care is frequently hit or miss. 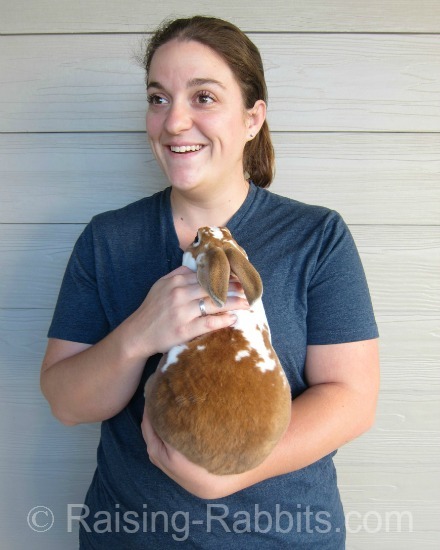 This is why rabbit owners talk about the difficulty finding a "rabbit-savvy" vet. 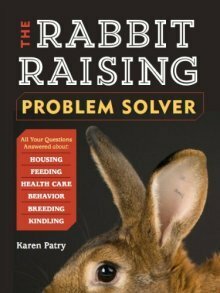 Raising-Rabbits believes the best and ONLY approach to eradicating this RVHD outbreak is to trap and kill 100% of the feral rabbit population in affected areas. Will the BC politicians or Animal Control officials will have the fortitude to do this? It is doubtful! But without full eradication of the feral rabbits, it will be impossible to achieve full eradication of the lethal virus. If RVHD becomes permanently endemic in BC, all rabbit owners and breeders will be condemned to relying on vaccines that are at best 85%-90% effective to at least give their rabbits a fighting chance. (This means some vaccinated rabbits will still die from RVHD.) And on a long-term basis, RVHD will end up spreading throughout both the USA and Canada thanks to its persistence and lethality. 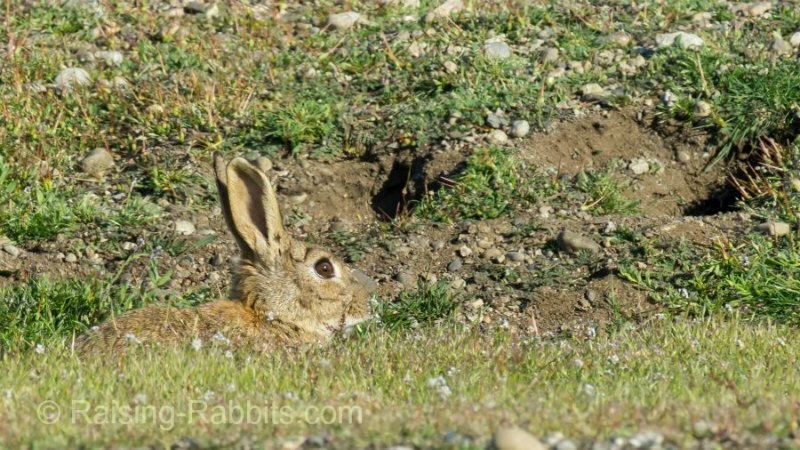 Feral San Juan Island rabbit lurking and feeding near one of its many burrows. Would you like to make a report to BC's Chief Veterinarian? That email address is not a live link - delete the spaces before and after the @ sign, then copy and paste into your email. Please encourage her to do all in her power to eliminate the RVHD virus from the environment, including the complete eradication of the feral rabbit population in all affected areas. Please remind her that relying on vaccination to protect domestic pets and livestock rabbits is not completely effective resulting in continuing losses for rabbit owners. Please remind her that efforts in Australia to eliminate feral rabbits with biological means ultimately failed THREE TIMES. Please note that giving a foothold to RVHD in BC will result in the spread of the virus throughout North America. Feel free to direct her to the expertise of Raising-Rabbits.com should she need clarification. See our info about RVHD in BC to best understand the problem and the best solution. Learn more about Rabbit Hemorrhagic Disease here, including pathology and quarantine measures. Like this June 2018 Rabbit Rhythms Newsletter? Your friends at Raising-Rabbits.com wish you a wonderful summer.